U.S. Treasury Department data released in December revealed that Japan has surpassed China as the largest foreign holder of U.S. Treasuries. 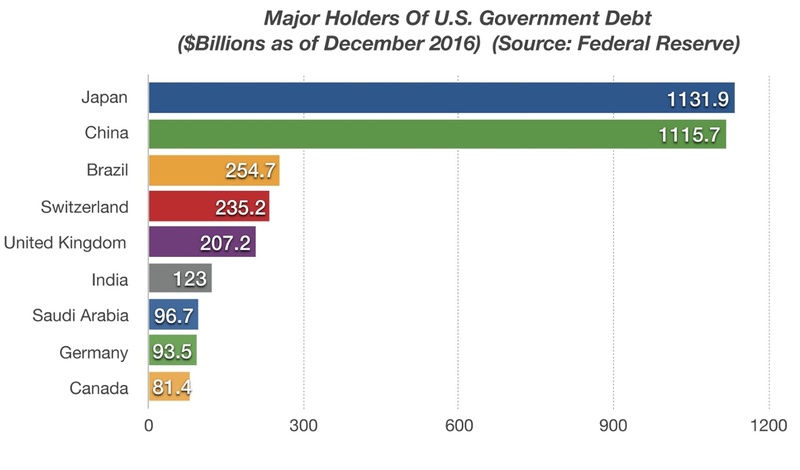 For years, China has held more U.S. Treasury debt than any other country, making it the single largest foreign creditor. As pressure has mounted for China to allow its currency to float freely, it has gradually been selling Treasuries in order to raise liquidity and help elevate its currency. China has been careful not to create any perceived issues with its currency since the yuan became part of the International Monetary Fund’s (IMF) special drawing rights in October 2016. This will allow the yuan to become a legitimate reserve currency along with the euro, pound and dollar. China’s position in U.S. debt is at its lowest levels since 2010. Upcoming elections in France and Germany are being influenced by sentiment in other European countries. Regardless of the country, populists throughout Europe share similar sentiment regarding immigration, austerity measures and rules brought upon by the European Union (EU). The concern is that strengthening sentiment could help lead certain EU members’ discontent with the status quo and follow in Britain’s footsteps. European leaders and the ECB are all very sensitive to the possibility of additional EU departures.